Recall that story about the operators of YouRather.com deciding to fight back against Spin Master over the phrase, “Would you rather…?“? Well, after publishing it, I was contacted by the operator of a similar website that also had a run-in with Spin Master. Rrrather.com, however, decided to avoid the confrontation simply by varying the wording of its questions and avoiding the use of “…?” at the end of each. But that doesn’t mean that Spin Master hasn’t actually sued anyone. In fact, the company filed suit Thursday against its own former attorneys, Howard & Howard. 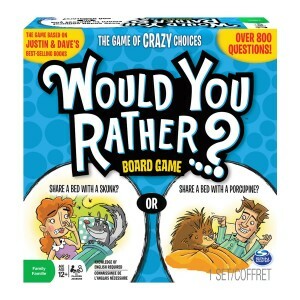 Spin Master’s claim of malpractice asserts that Howard & Howard failed to renew the trademark for Would You Rather…?, allowing it to lapse weeks before the trial against Zobmondo Entertainment. Spin Master further claims that while the firm did eventually register a new trademark, Spin Master’s case against Zobmondo required such restructuring, and its future position has been so weakened, that Howard & Howard should compensate Spin Master at least $3 million.